TEX Rail is a 27-mile commuter rail project being developed by the Fort Worth Transportation Authority (The T) and will be the next passenger rail service coming to Tarrant County. The opening commuter rail line, or initial service section, will extend from downtown Fort Worth, and continue through North Richland Hills and Grapevine to the northern entrance of Dallas/Fort Worth International Airport (Terminal B). Projected to have more than 8,000 daily riders at the initial start of service and using nine rail stations, by 2035, the ridership is expected to have grown to 13,000 daily riders. The commuter rail, projected to open for operation in 2018, will extend from an existing rail line in Downtown Fort Worth, will continue through northeast Tarrant County including North Richland Hills and Grapevine and will end at the northern entrance of the Dallas-Fort-Worth International Airport, Terminal B. To ride the full rail length from the existing T&P Station in Downtown Fort Worth to Terminal B in DFW International Airport is estimated to take 55 minutes, at speeds up to 59 miles per hour. By 2035, the train is anticipated to run every 30 minutes during peak commute hours and about every 60 minutes outside morning and evening rush hours. A half-cent sales tax is directed toward economic development, of that 75 percent is allocated to the TEX Rail project as a part of an approved comprehensive sales tax passed in 2006 by Grapevine voters. 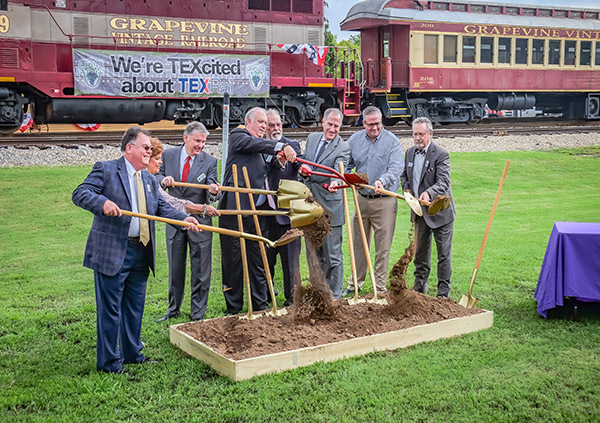 The development and arrival of the TEX Rail stations to the City of Grapevine has the potential to enhance the quality of Historic Downtown Grapevine and bring new retail dollars to the community. By ease of access and increased foot traffic to Main Street, Grapevine anticipates the spread of the cherished history and charm of Grapevine.